Liam linked to an interesting, but somewhat scattered/brief look at the Benedict Option here. Political philosophy is not my thing. I admit being unschooled in exactly what the BO is–I was thinking it was the meme Small Church Getting Smaller semi-attributed (and perhaps not altogether justly) to Pope Benedict. And for some that’s just what it looks like. As I finish my dinner and get ready to return to a gritty project of removing bathroom paint and making that locus spiffy, a few thoughts. 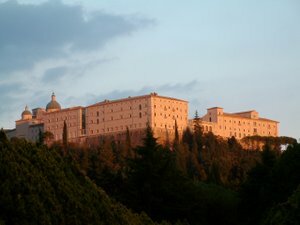 The predecessors of Benedict were the desert monastics. Benedict wrote the rule, but those retreating into the wilderness did so with two important factors of awareness. One, certainly, was their disappointment that a mainstream Christianity had lost some of its verve. And while I’m sure few longed for the return of persecutions, the fact was that the Church had scooped up quite a lot of sinners and other questionable characters. The difference for Anthony of the desert and his companions and imitators is that these hermits were aware of their own sinfulness. Getting into caves and onto mountains was as much about the longing for personal purification as it was about retreating from the foul influences of the culture, and even the neo-institution of the Church itself. The problem I have with many Christian culturewarriors is that they have yet to reach first base in the sense of their own sinfulness. They whine, fret, and complain about others’ offenses, and even as many of their own fall to scandal–sometimes embarrassingly public–there is little sense that they have embraced the fullness of the Anthony/Benedict Option. Maybe secular political types cannot abide admitting error. Well enough–it’s tough for anybody. But please: don’t wrap oneself in the mantle of the abbot from Nursia unless one is prepared to do the whole program. While we’re on the topic of morality, I have yet to see that conservatives are any more moral than liberals. Maybe the former are more perturbed when the latter call them out for hypocrisy. I know, I know: abortion trumps everything because of the tens of millions slaughtered, presumably with liberals holding the legislative gavels. I still remember with much bitterness the 70’s, when the GOP governor of my state endorsed abortion-on-demand even before a GOP-packed SCOTUS opened the floodgates. Neither side of the political abortion debate is squeaky-clean as far as I can see. I don’t think anyone: politico in retreat, commune-seeker, or rat withdrawing from the race can pick and choose the aspects of the Benedict Option. To deserve the title, I think one must opt for the whole package. And when I think Benedict, I think first of the virtue of hospitality. Many conservatives I read are not all that welcoming, especially to those who disagree with them. And that doesn’t even touch on other values that define that so-called option: penitence, silence, respect, physical labor–in other words, the seeking of holiness. I do believe conservatives have something to contribute to the discussion of “Options,” and I’d love to read more, but perhaps those serious about St Benedict might consider spending several days at a Benedictine monastery before writing too much more about it. Back to ora et labora. But if someone has something more to offer on the Benedict Option, I’ll be all ears later. This entry was posted in Politics, spirituality and tagged Benedict Option, culturewar. Bookmark the permalink. The meme of Benedict Option originates not in the Rule but in the writings of Alasdair MacIntyre – it’s not a literal invocation but a metaphorical one that is distinguished from The Real Thing. STill seems like they’re basing it on a fundamental misunderstanding of Benedictine spirituality.